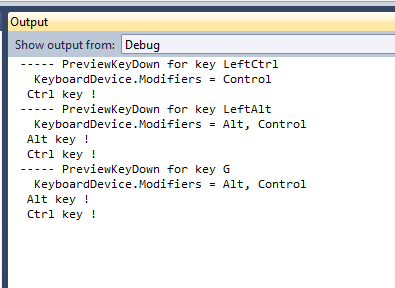 In a WPF keypress handler (PreviewKeyDown, KeyDown, PreviewKeyUp and KeyUp), you can check for the presence of one of the modifier keys using the KeyEventArgs.KeyboardDevice.Modifiers property. This property is an enumerated type that is a bitwise combination of the possible values. You can check for the presence of one of the modifiers by doing an AND operation against the modifier. Your website contains a lot of useful info — impressive! One question. Do you know whether your proposed solution (using e.KeyboardDevice.Modifiers) obtains the state of the modifiers when the KeyDown event occurred, or the current state of the modifiers? If it obtains the current state of the modifiers, that can cause a bug when the system is under load and the invocation of the KeyDown event is delayed. AJ, I believe that Modifiers reports the current state of the keyboard. You won’t run into problems, though, because you’d have pressed Alt or Ctrl before the key for which you define the PreviewKeyDown event. So if the user pressed Alt/Ctrl before another key, Modifiers would always correctly represent the Alt/Ctrl state by the time that you get PreviewKeyDown.